Ecuador is a country that forms part of the rim on the Pacific Ocean known as the Pacific Rim of Fire with many volcanoes and much earthquake activity. Just last week ( August 12th ) we experienced a 7.1 earthquake that shook the entire country but fortunately caused little damage. 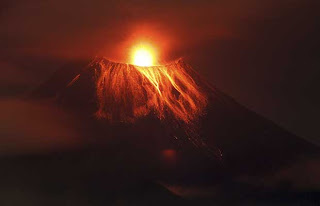 In late May the Tungurahua volcano erupted. The Tungurahua ( Quichua for "Throat of Fire" ) Volcano is one of Ecuador's and South America's most active and highest volcanoes. Part of the Sangay National Park it is located in the Andean Range, 140 km south of Quito the capital of Ecuador, known as the Avenida de los volcanes. On the opposite side of the "Avenida de los volcanes", towers the huge Chimborazo. With luck, you can even see the green carpet of the Amazon basin between the clouds, or the fire spying Sangay volcano. A new lava dome has been growing in the summit crater since 2000. Tungurahua is a stratovolcano that is steep sided and with an almost perfect cone. The steep slopes of the volcano are used for agriculture. Tungurahua is at an elevation of 5,016 m and just tops the snow line of about 4,900 m. Tungurahua featured a small summit glacier that melted after the increase of volcanic activity in late 1999. The small, but extremely popular tourist thermal springs town of Banos is located at the foot of the volcano 5 kms to the north and 15 km east of Ambato ( Ecuador's fourth largest city and also the capital of Tungurahua province ). The catastrophic eruption was in 1777, when several villages at the flank of the volcano were destroyed. Tungurahua's activity restarted in October 1999 with major eruptions in August 2006, February 2008 and the last in May 2010. On the morning of May 28, 2010 the volcanic activity suddenly increased and there was a large explosion that caused a column of ash to plumb about 10 km above the crater. The eruption showed signs of declining early in the afternoon but vibrations or seismic tremors continued. The volcanic activity forced the evacuation of approximately 2,500 people from five communities surrounding area near the volcano and also closed some airports. This eruption of Tungurahua caused the fall of ashes in many towns on the coast as far away as Guayaquil, and in the Andean highlands. The Director of Civil Aviation made a decision to close the airport in Guayaquil and surrounding villages. Flights were also suspended between Quito and Lima, Peru. Flights were also suspended between Quito and Cuenca and Loja which is in the south of the country. The eruption in October 1999 caused the government to evacuate people living in the area of the volcano. More than 20,000 people, including all the city of Banos were moved to shelters in nearby larger cities and in particular to Ambato. All the roads leading to the area of Tungurahua were closed and were patrolled by the military. This interrupted the major access to the Amazon - the Ambato/ Puyo highway. Banos became a ghost town that had no apparent life although a few people stayed behind and were hidden away in the church and also their homes. Other people also bypassed the military controls so they could tend to their farms and many more began to request to be able to return to their homes and businesses. Just prior to Christmas 1999, the tensions came to a violent conclusion as protesters confronted the military, claiming one person's life in the clash. After the events the authorities let people return at their homes and businesses at their own risk although nothing really had changed yet to the danger of another eruption. The activity continued on a medium level until May 2006, when the level of danger was raised from a yellow to an orange alert. The eruption in August 2006 was the most violent since it restarted activity in 1999 and this eruption produced a 10 km high ash cloud which spread over an area of 740 km by 180 km and the pyroclastic flows caused 7 deaths and destroyed several roads on the north-western and western slopes of the volcano. Ecuador is a great outdoor destination offering many climbing, trekking and hiking opportunities. Most are close to Quito which avoids long expedition style approaches of high altitude climbs in other parts of the world. The snowcapped volcanoes of Cotopaxi, Antisana, Chimborazo, Iliniza South Peak, Cayambe, Carihuayrazo, Altar and Sangay are waiting in superb mountain scenery for the skilled climber. Using a ASEGUIM certified mountain guide many of these summits are within the reach of novices. Tungurahua was first climbed by two German volcanologists Alphones Stubel and Wilhelm Reiss in 1873. Climbing of Tungurahua is no longer advised due to the high level of activity but if one insists on climbing this volcano the best time to climb would be December – January or July – August. The mountain is considered "abnormal" between the climbers. On one hand it is "very easy" and on the other hand "one of the hardest". Both opinions are correct. As you don't have to pass crevasses or scarped ice-walls, the ascension from Baños (1800m) to the summit at 5000m does not present any technical difficulties. The crampons just have to be put on the last part, below the border of the crater. An ice pick is necessary when the wind is strong. But physically, the Tungurahua is a hard challenge. Most of the time you walk steeply uphill- directly into the sky! Beginners should in no case renounce an experienced guide. Unforeseeable weather changes or heavy snowstorms have demanded several victims on this mountain.